"We came to <?xml:namespace prefix = st1 ns = "urn:schemas-microsoft-com:office:smarttags" />Inner Mongolia three and a half years ago," said Irineshna Gormarsharov, a forty-five year old Russian national. "My husband arranged to do some business in China because we wanted to bring our children specifically to Hohhot to study Mongolian and Chinese. We are Buryats by race, a kind of Russian Mongolian tribe. My husband and I speak the Buryat language but my children were raised in Russian schools; they had forgotten how to speak their national language. I heard about this school and immediately enrolled Yura, my ten year old, into classes. 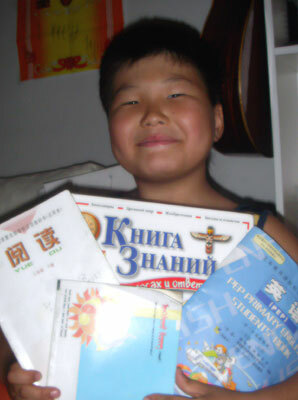 After three years he now speaks Mongolian and Chinese fluently, and in Russia he learned English and of course Russian. He studies English at school as well; they have an American teacher. We speak Russian at home. My husband and I are very pleased: my son is fluent in four languages. Also, he will make good connections with his Chinese classmates. We feel that Chinese is the language of the future. At the same time he is learning Mongolian, so he can understand his grandmother and other relatives who speak the Buryat dialect,"She smiled broadly. Yura indeed is a walking linguist. Lively, friendly and open, the boy spoke to me fluently in English and Russian (my second language) and then ran off, yelling happily in Mongolian to his two best friends. A few minutes later a Chinese-Mongolian teacher hustled the children into a classroom. The children opened their bi-lingual books and recited in both languages without mishap. Watching them I felt envious: how difficult it was for me to gain my second and third languages as an adult and how facile it seemed to be for these kids. "My son is teaching me now,"remarked Irishena, as we all rode home from the school by bicycle. "He acts like a translator and I hope he will eventually do something significant with his four languages." Mrs. Gormarsharov also told me that her elder son, Amgalan, studies at the Hohhot Medical College. "He is now twenty. He insisted on coming to Hohhot last year,"she explained. "Because earlier he was studying in Ulan Bator at a Buddhist medical school but he wasn't learning enough. He did learn Mongolian there. 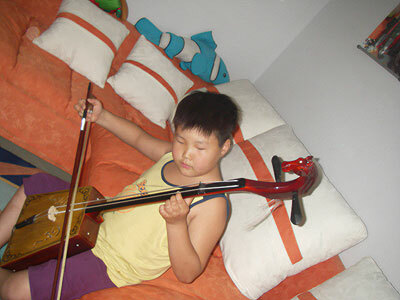 But here he feels more satisfied: he is studying traditional Chinese medicine, Mongolian medicine and some western medicine as well. Amgalan will be an MD in a few years and serve as a doctor, but he's not sure which country in the world he wants to settle down in. Last week it was Germany. Amgalan also speaks fluent English, Russian, Mongolian and now Chinese." Certainly Mrs. Gormarshov's children are exotic and well educated by western standards. But they are not the only foreign population entering Inner Mongolia seeking a superior bilingual education. Miss Sun, assistant director of foreign affairs at the Inner Mongolia Agriculture University, estimates that there are over one hundred primary school children from Outer Mongolia receiving a Chinese education. "There are also over four hundred university students studying at the three main universities here: Nei Da, Shi Da, and Nong Da," She added. "And probably a few dozen at the vocational schools too. They come both on scholarships and independently because the Chinese educational system holds academic and financial incentives." Westerners are also catching on to the fact that the Inner Mongolia University offers intensive academic language programs in both Mandarin Chinese and Mongolian. Courses cost less than half the Beijing standard. "I'm here because I like the exoticness of Inner Mongolia," said Flora Rulles, an American girl who is adding both languages to her repertoire. "I'm a linguist; I'm having the time of my life learning these two languages." Another student, a French scholar on leave from Oxford, summed it up well by stating: "Whatever your preferences, whatever your nationality, if you come to Inner Mongolia you will find Mongolian culture flourishing. The people are friendly, the language beckons those with a linguistic bent, and the food, I can assure you, is well worth the trip."